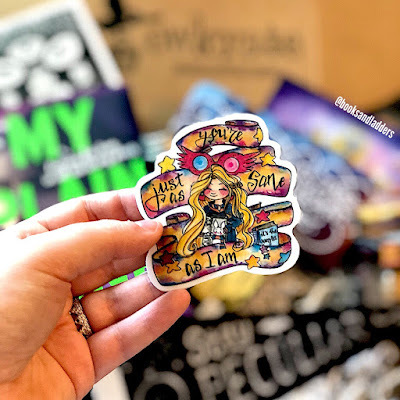 Subscription Box #Review: July 2018 #OwlCrate! I just looked at my bank statement and it cost me $53.54 Canadian. Which is a BIT expensive for me but I am making money now so it's all good. I got the email notification on a Monday and I got the box on a Thursday. Very quick turnaround time. I was very impressed. The ordering process is simple. Choose your box, put in your shipping address, and boom! Plus you can pay with PayPal which makes it super convenient and easy. The book of this month was ... MY PLAIN JANE by Cynthia Hand, Jodi Meadows, and Brodi Ashton. I feel like this one wasn't really worth it for me. To be fair, I thought about skipping it because the theme "Strange and Unusual" didn't really appeal to me because those aren't typically the books I read. But I saw a Raven Cycle themed item was in here so I tried it, but I was a little disappointed. I did let my subscription renew for the "Ruthless Royals" box so hopefully I am satisfied with that. If not, I may stop subscribing to OwlCrate. Do you purchase subscription boxes? Are you going to check this one out?